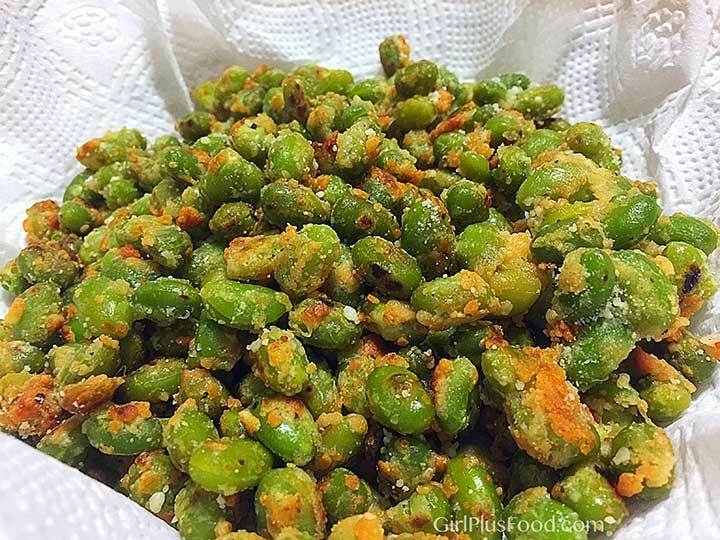 Edamame beans (soybeans that are harvested before they’ve ripened or hardened) are not only a yummy, low-calorie snack… they’re high in protein, naturally gluten-free, zero cholesterol, and an excellent source of fiber, smart fat, iron, and calcium. If you’re still wondering what these things are… well, if you’ve ever been to a Japanese restaurant, you’ve most likely been served this as an appetizer while you’re waiting for your order to arrive at the table. 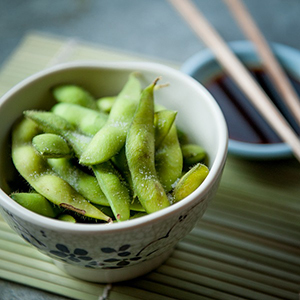 They’re usually served as pods that you squeeze to pop the beans into your mouth… so not only are they delicious and nutritious… edamame is kinda fun to eat too! So now that you know what they are (and if you don’t, you can easily Google it like everything else), I’d like to share with you my new favorite way of enjoying these magical beans! Tossed in olive oil and coated with parmesan cheese and garlic powder, these little green guys are baked until the cheese coating is golden brown crisp! The flavor is UNREAL and the boy & I absolutely enjoy munching on these as we work and study! Prep is easy peasy, so give ’em a try!